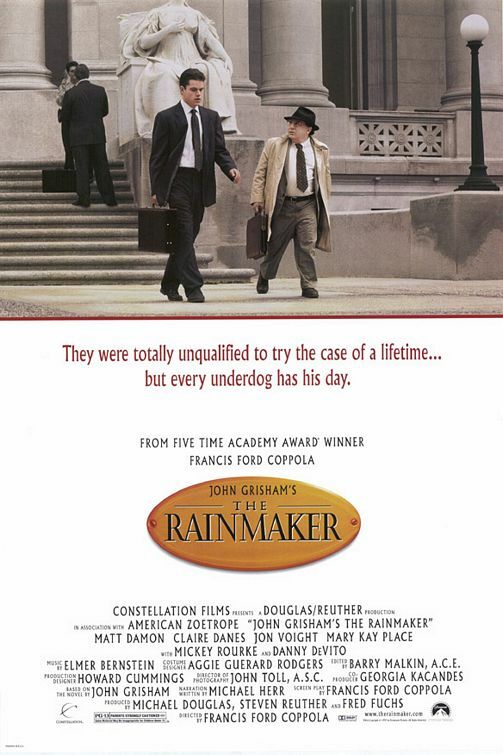 The Rainmaker – They were totally unqualified to try the case of a lifetime…but every underdog has his day. Screenplay by Francis Ford Coppola. Based on the Novel by John Grisham. Francis Ford Coppola writes and directs this great movie about a young new lawyer Rudy Baylor (Damon) who is thrust into the legal big leagues, when he takes on a huge insurance company during his first case. The playing field is less than level and Rudy is forced to learn on fly as he protects his clients interests. The side story with Kelly Riker (Danes), Baylors’ love interest in the movie, is a little over the top. Deck Shifflet (DeVito) shows Baylor the ropes and helps the young attorney make his way through his rough beginning. There are great performances throughout this movie and I enjoyed this story as Francis Ford Coppola told it. If you liked this try: The Verdict, A Civil Action, Erin Brockovich.